Illus. in full color. 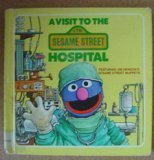 "Grover, his mother, Ernie and Bert visit the Sesame Street Hospital in preparation for Grover's upcoming tonsillectomy. The familiar characters change an unfamiliar hospital into a place to be trusted, and many typical questions are discussed. Valuable." --School Library Journal.